Opinions are divided on the value of making credentials mandatory for medical transcriptionists. A few letters behind someone’s name, such as MD, JD, or PhD, can make a difference in the perception of that person’s knowledge and credibility in his or her given field. Does that bias extend to certified medical transcriptionists (CMTs) and registered medical transcriptionists (RMTs)? Voluntary certification and credentialing is a facet of HIM that puts MTs in a bit of a quandary. Peter Preziosi, PhD, CAE, CEO of the Association for Healthcare Documentation Integrity (AHDI), says the organization is thoroughly behind the push to credential. “A credentialed workforce safeguards the public. Information in the healthcare record has patient safety implications, impacts coordination and continuity of care, and ensures record keeping is accurate and complete for billing and insurance purposes,” he says. Credentialing ensures a healthcare system has a reliable, knowledgeable workforce, and a credentialed workforce distinguishes the profession from other allied healthcare fields and shows the public there is a distinct body of knowledge and scope of practice necessary to perform as an MT, according to Preziosi. Without the credential, there is the false perception that anyone can do what an MT does, making it more difficult to secure a qualified workforce. Preziosi says the medical transcription industry is being threatened by the advent of self-edited, real-time speech recognition; templated documentation; and emergency department scribes who are not adequately trained in privacy and security regulations, medical terminology, document clarity and formatting, and code sets—all essential MT skills. This can jeopardize the integrity of medical records, which becomes a major concern as more healthcare organizations make plans to exchange data electronically. Even with these new methods of gathering health information, Preziosi says it’s still necessary for someone to determine whether information is being captured, displayed, and transmitted so it is accurate, useful, and complete. “The physician may use front-end or back-end speech recognition but still needs to have a documentation expert. A drop-down menu won’t tell the patient story and provide the clinically rich information the way narrative does,” he says. Certifying professionals in their respective domain is extremely important to the AHIMA as well, adds Michael Niederpruem, MS, MA, CAE, the organization’s vice president of certifications. Among the HIM and technology professionals served by AHIMA credentials are coders, HIM professionals, health information technologists, and those specializing in health data analytics and security and privacy. Niederpruem notes that it can take time for the importance and value of credentials to be accepted by employers. “Our renewed commitment to certification excellence began in 2007. And for any credentialing organization, you really need critical mass to not only establish but also sustain a credential successfully over time. It requires a significant investment of time, money, and human resources to promote and establish … credentials, and it requires the significant support of a parent organization as well as the endorsement and potential partnership(s) of other organizations,” he says. While some healthcare professionals, such as physicians, are regulated and therefore have no competition per se, many others, including those in the medical records arena, operate in a competitive market where there are no laws regulating what professionals can or cannot do or what credentials they must have in order to work. According to Niederpruem, this can result in a devaluation of credentialing, making it difficult to convince employers that the designation CMT or RMT carries weight. 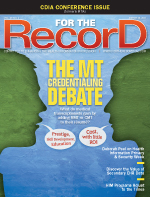 Kathy Nicholls, CMT, AHDI-F, of Nicholls Consulting Service and owner of MT Tools Online, believes more evidence is needed on the value of being credentialed. “The challenge is when you look at the statistics, it says that about only 1% of MTs are certified. Some really good MTs don’t hold the credential. Mandatory credentialing would not allow the volume of transcription to get completed within the tight deadlines that healthcare operates in. There must be a compelling story of why having a credential should be mandatory, and we must develop the story from data. We don’t have enough data collection to show proof it really makes a difference or how important MTs are in making sure the medical record is correct,” she says. Nicholls finds that employers hiring MTs will note “CMT, RMT preferred” in their ads and agrees with Preziosi that in those instances it could make a difference in who gets hired. “When I was hiring MTs, if I had two equally competent people who tested the same, I would hire the CMT because in order to keep certification, it requires continuing education. It doesn’t mean that the non-CMTs are bad transcriptionists or don’t continue their education, but it shows the medical professionals their commitment to staying on top of the changes in medicine,” she says. Dale Kivi, MBA, business development manager at FutureNet Technologies Corporation and a member of the board of directors for the Clinical Documentation Industry Association (CDIA), says he understands and appreciates the efforts of industry organizations that promote credentialing. However, he says organizations that purchase transcription services don’t seem to care whether the labor force is credentialed. Their interest lies in stipulating quality expectations and holding vendors to those levels, regardless of whether the staff are credentialed. Kivi believes the demand for credentialing must start with buyers. Given the competitive nature of the industry, it is uncommon for transcription services to provide incentives for credentialed employees, such as premium pay rates, when business is typically awarded to the lowest price with the same quality expectations. “Cost is expected to be low, but quality is expected to be high. As a business manager trying to win business and manage costs, it’s hard to justify additional expenses for a credential if it does not directly lead to a competitive advantage in the mind of the buyer,” he says, adding that the reality of today’s marketplace is that such preference for a credentialed labor force is rarely expressed. Kivi views becoming credentialed as a valuable career achievement that enhances an MT’s ability to land jobs in quality and production. However, the reality is that unless driven by the client, it is difficult to motivate service vendors to make that investment. Kathryn Anderson, CMT, AHDI-F, president-elect of the Texas chapter of the AHDI, applauds the move to become credentialed, saying it has helped her become a supervisor as well as a quality auditor. The latest version of the AHDI’s exams test for core competencies and the essential skills required of documentation professionals. They feature more questions on technology skills, privacy and security regulations, medical interventions, terminology, and pharmaceutical use. To increase the accessibility of the exams, the AHDI’s testing partner deploys online proctored surveillance technology that allows candidates to take the test from their homes or offices. Besides the RMT (level 1) and CMT (level 2) exams, there is the credentialing qualifying exam (CQE), which allows individuals who pass the RMT requirements to immediately test for the CMT credential. “The CQE is a great tool for employers. An employer can find out competency levels of their employees and use this information to develop proper staff development programs or to deploy MTs on certain jobs that best meet their skill set,” says Preziosi. Dubson says the AHDI’s revised exams are a fair representation of what a transcriptionist actually needs to know and approves of the concept behind the RMT credential. “I like the idea of having an entry-level credential so [MTs] can see what they need on the job. The RMT gives new graduates a place to measure what they know,” she says. Anderson agrees, adding that the RMT exam is an excellent starting point for new MTs that will open doors to those without prior experience. “The exams have been updated, but one thing that hasn’t changed over the years is that you have to know medical records inside and out to pass them,” says Anderson, who suggests turning to online resources or local AHDI chapters for support when preparing for the exams. Nicholls recommends taking advantage of the many study options that cover the new material, including online prep courses, to make preparation more accessible and affordable. Nicholls says some employers are starting to recognize the value of credentialed staff, but in many cases, there is no financial incentive for MTs to take the plunge. Some employers do pay more for credentialed MTs (approximately 16%, according to a recent survey conducted by MT Tools Online). In those cases, Nicholls calculates that for a pay increase of 1 cent per line, a CMT producing 1,500 lines per day can earn nearly $2,000 more in annual income for the approximately $500 investment in taking the exam and keeping up with the continuing education. Dubson says she often hears other MTs say, “I don’t need that test to prove something I already know.” She also understands that many MTs are working harder now for less money and don’t have time to think about becoming credentialed. However, she sees a lot of value in joining professional associations just to keep track of what other MTs are doing and to stay in touch with industry happenings. According to Dubson, the AHIMA makes it easier to manage her credential because she decides which online modules to take for continuing education. With the AHDI, however, she says continuing education requirements must be taken across a variety of subjects, making the process more complex. Either way, Dubson believes the cost of becoming credentialed and maintaining the required continuing education is well worth it. Anderson finds that maintaining certification is more difficult than ever because of stricter guidelines that ensure the continuing education is relevant and useful to MTs. “Even in lining up speakers for our meetings, it has to be a topic that will further the knowledge of the MTs,” she says. Limited time and finances are two of the reasons MTs have given Anderson for not pursuing the CMT. Others cite a lack of support from their employers. Anderson knows firsthand the value of a helping hand. “While transcribing pathology and radiology reports at a small hospital, I learned about the CMT credential and decided to go for it. The clinical technicians, radiologists, and pathology techs really set out to help me by explaining their reports in more detail so I could learn what made a good report,” she says. Anderson says the unique nature of being an MT makes becoming credentialed a wise move. “You spend years in your home office working alone, don’t talk to anyone in the profession, and can potentially lose sight of the personal value you have to the profession. With CMT behind your signature, you know the value,” she says. Dubson believes the AHDI is trying to make the CMT credential mandatory in an effort to elevate a profession whose identity is sometimes compromised by the fact that there is no formal education required to become a member. Will credentialing become mandatory? The challenge is that the medical transcription sector often goes unnoticed even though it produces 1.2 billion records annually in the United States. Preziosi believes once policy makers and regulators recognize the amount of protected health information being exposed to unlicensed individuals, the need for credentialing will become more evident. — Annie Macios is a freelance medical writer based in Calgary, Alberta, Canada.